Hello everyone, Yvonne here! 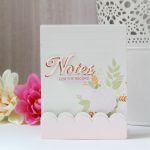 Today, I am creating a birthday card using the new Die D-Lites™ Flight 1 die template set. The Die D-lites™ are perfect to combine with more classical designed such as the Fleur de Elegance set. 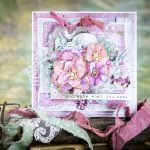 This card is all about simple layering, so quick and easy to make! 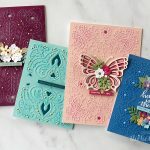 Trim white cardstock to size 11¼ x 7¼” and fold to a card base size 5 x 7¼”.  x 7″. and glue upon card base.  x 6¾” and glue upon cardbase. Cut/emboss S4-475 Fleur de Elegance Die #3 (with #1 being the smallest die-template) from green cardstock and stencil the edges using silver ink. Glue upon card base using 3D foam squares. Cut/emboss Classic Ovals Large #5 from white cardstock and glue upon card base using 3D foam squares. Cut/emboss Flight 1 #birdcage from gold cardstock and glue to card base using 3D foam squares. Cut/emboss Flight 1 # sitting bird from black cardstock and glue to card base. sentiment upon using black ink. Glue banner upon card base using 3D foam squares. stopping by and wishing you happy crafting!